MyBlogSpark is sponsoring another contest - this time for snacks! This giveaway, information and product were sent via General Mills through MyBlogSpark. Cocoa Puffs Treats Triple Chocolate: An indulgent cereal bar that combines the great taste of Cocoa Puffs cereal and chocolate into one decadent treat, Cocoa Puffs Treats Triple Chocolate is perfect for satisfying any sweet tooth. Bugles Hot Buffalo: Need something salty with a bit of a kick? Look no further than Bugles Hot Buffalo Crisp Corn Snacks, which blends the taste of hot buffalo sauce with crispy corn Bugles. Nature Valley Oats `N Dark Chocolate Crunchy Granola Bars: If you want the best of both worlds, give Nature Valley Oats `N Dark Chocolate Crunchy Granola Bars a try. These bars mix dark chocolate pieces, oats and crisp rice nuggets for a classic crunch and burst of whole grain goodness, making them a perfect natural snack that's high in fiber and protein, but low in saturated fat. 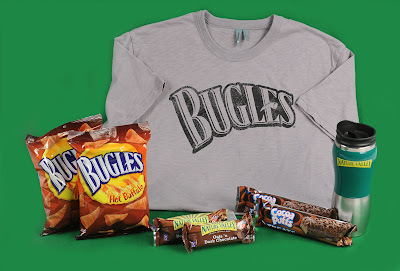 Plus a pretty nifty Bugles t-shirt in that distressed type all the kids love and a heavy duty Nature Valley coffee travel mug! 1. Comment and say whether you are a salty or sweet snacker. I'm a sweet snacker, there are always fresh baked goods in this apartment. Contest is only open to US residents. I'm sorry guys but they mail the packages. Contest ends May 19th, 2010. Good luck! Oooh . . .well since you asked. . . I guess I'm a sweet snacker. Thanks Anny! I'm a sweet snacker....which is why I try not to keep ANY sweet snacks here! I tend to eat them all in one sitting. lol. Thanks for entering me in the giveaway. I'm more of a salty snacker, but I really love the two combined like chocolate covered pretzels and nuts! I am definitely a salty snacker. Potato chips, pretzels, nutes, etc!! Depends on the day, I could do either sweet or salty. However, "cheesy" is always welcome! I think it depends on what is in front of me because I could scarf down chips and guac or fresh baked chocolate chip cookies with equal pleasure! I'm a pretty equal snacker when it comes to sweet or salty. Lately though, I've been eating sweet & salty almond breakfast bars that have both! Sweet, but I do like my salty, too! Totally salt...vinegar&salt Pringles are my way tgo go! I would have to say sweet snacker. I am a sweet snacker. Hi! I am a salty snacker mostly...but sometimes I am a sweet snacker too. Great giveaway! Sweet snacker. I'm eating chocolate as I'm writing this.